Visit Real Haunted Castles in Ireland! There are real haunted castles in Ireland. So the stories go. I visited more than one on my recent castle tour. If you are interested in scary and gruesome stories, you will want to learn more. Some of the haunted castles you will want to visit, some you may want to stay in and some you won't want to go near! As you know, many battles took place in Irish castles over many centuries of struggle for Irish rule. Violence and bloodshed took many lives. Some of the castle ghosts were involved in the fighting; some had other personal tragedies. It is said that the resident ghosts or spirits have stayed on after their earthly deaths and are not able to move on. Ardgillan Castle is twenty miles north of Dublin, on the coast between Balbriggan and Skerries. The ghost of a woman is said to haunt the "Lady's Stairs" railway bridge on the estate. 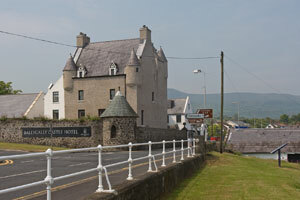 Ballygally Castle is 20 miles from Belfast on the Antrim coast in County Antrim, Northern Ireland. It is a beautiful castle hotel and is said to have its own friendly ghost! Carrickfergus Castle in County Antrim, Northern Ireland is home to "Buttoncap", the ghost of a young 16th century soldier. Castle Leslie in County Monaghan, Northern Ireland is a beautiful castle said to be haunted by Norman Leslie who died in battle during World War I.
Charleville Castle is in Tullamore, County Offaly, in the East Coast and Midlands Region. It is said to qualify as one of Ireland's real haunted castles. It is haunted not only by the ghost of its former owner, but also by druids buried on the grounds and by a little girl who fell to her death from a high staircase. When I visited the castle, some investigators of paranormal activity were setting up their equipment to detect spirits. 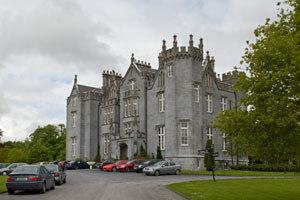 Clonony Castle (link opens in a new window) is in Birr, County Offaly, in the East Coast and Midlands Region. 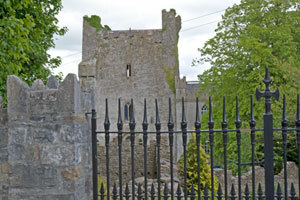 It is near the Shannon River and has shown a ghostly figure of a man in one of its towers. Gormanston Castle in Gormanston, County Meath, in the East Coast and Midlands Region, was owned by a family for seven centuries. Legend has it that foxes surrounded the castle whenever a family member was dying. The castle is now used as a boys'secondary school. Huntington Castle in Clonegal, County Carlow, in the Southeast, is built on the site of a Druids Temple. 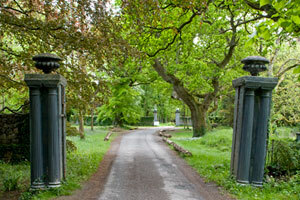 Spirits of deceased monks, Lady Esmond and a soldier occupy this large estate. Killua castle in County Westmeath, in the East Coast and Midlands, is said to have a ghostly figure of a former employee of the family wandering about at night. Kinnitty Castle , near Kinnitty, County Offaly, in the East Coast and Midlands Region, is a beautifully restored castle hotel situated on land once inhabited by Druids. This castle has the resident "Phantom Monk of Kinnitty". Leap Castle near Roscrea, County Offaly, in the East Coast and Midlands Region, is considered by many to be the most haunted castle in Ireland. The bloody past of massacre and murder led to the presence of unhappy ghosts and unexplained noises, placing Leap Castle at the top of the list of real haunted castles. Wilton Castle in County Wexford, in the Southeast Region, is said to be home to the ghost of a former magistrate, a former actress, and a former castle resident. If you do research into Ireland's real haunted castles, you will have a bit of fun on your castle tour. It is always more interesting to visit a castle and think about its legends and stories.